Following the distribution of the Spring School Bell, I have received a number of thoughtful questions regarding how our district is funded by the state. 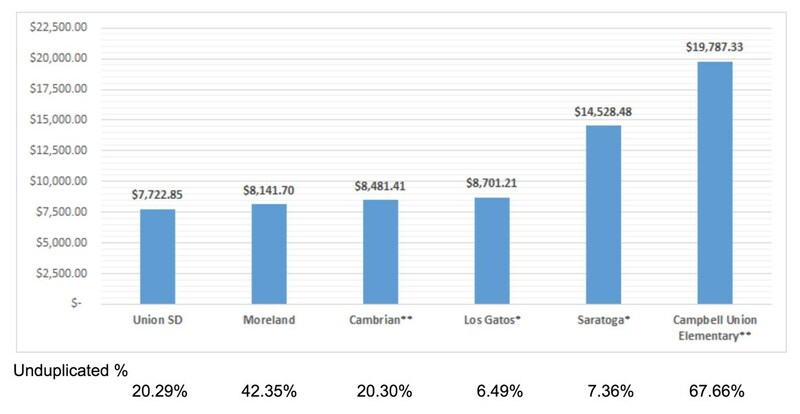 I've been asked by Union School District (USD) homeowners why they pay such high property taxes if we, as a district, do not reap the benefit. Schools districts receive funding based on the state’s Local Control Funding Formula (LCFF). The LCFF revenue is funded by property taxes and state aid. It is important to note that homeowners pay property taxes on the assessed valuation of their home. For residents that have owned their homes 5, 10, 20 or more years, their assessed valuation may be much lower than the market value. Districts that receive funding from property taxes and state aid are called “State Aid” districts. Union School District is a State Aid district. The state utilizes the following criteria to identify the funds received by districts: the district’s Average Daily Attendance, the numbers of students in state-identified grade level spans and the demographics of the student population. Districts that have higher levels of English learners, foster youth or socioeconomically disadvantaged students receive more funding. The following graph illustrates that there are vastly different funding levels in school districts that are geographically close together. Districts that receive all of their funding from property taxes are called “Basic Aid” districts. This happens when the amount collected from property taxes exceed the minimum funding amount the state determines districts should receive. The funding can be quite substantial. For a list of the Basic Aid districts, you may go to Ed Source: https://edsource.org/local-control-funding-formula-database/basic_aid.html. Union School District is not a Basic Aid District. Unfortunately, we are one of the lowest-funded school districts in the state of California. We have worked hard to manage our resources. We have the benefit of lease revenues from seven closed school sites and we are beginning to generate cost savings from our solar projects. We have also had the benefit of the use of bond funds for various construction and technology projects, as well as a parcel tax that we can use for more general purposes. Nevertheless, we are continuing to operate in a deficit; spending more than our revenues each year. I've been asked by parents, "What can we do?" At the March Board of Trustees Meeting, the Board passed a resolution sponsored by the California School Boards Association (CSBA) demanding from our State Legislature that California Schools receive Full and Fair Funding. Here is a link to the signed resolution: https://goo.gl/fvNVQ6. This resolution was sent to CSBA. CSBA is collecting signed resolutions from districts throughout California, approximately 1,000 districts, and will be lobbying the State Legislature for increased funding for California Schools. At our February Board of Trustees meeting, our Union District Educators Association (UDEA) President, Julie Guglielmo, invited me and the Board members to attend a legislative brunch to meet with Senator Jim Beall and other legislators to discuss issues facing California Schools, one of which being the under-funding of our schools. A Board representative and I attended the meeting to ensure that we could participate in the important discussions regarding the state's support of our schools. The Board of Trustees and I will continue discussions on ways to increase revenues and resources at our monthly meetings. Please make sure to read the Board Highlights that are emailed to you each month for updates on our discussions. We must work together to ensure that our our voices are heard as advocates for our students so we can continue to provide the excellent educational opportunities that support our children’s continued success.